Dr Patrick Senior Partner qualified in Newcastle in 1988 and migrated south after completing her general practice training in North Yorkshire. Her special interests include respiratory disease and Medicines Management. Outside work Dr Patrick enjoys playing tennis, all kinds of music (except jazz!) and has a keen interest in natural history. Having trained as a nurse at St Thomas’s Dr Wyatt subsequently qualified as a doctor in London in 1992. She has worked extensively abroad, including treating patients with wart hog injuries in rural Tanzania. Dr Wyatt joined the practice in 1997 and has several areas of special interest, including diabetes, coronary heart disease, paediatrics and obstetrics. To relax she loves anything to do with the sea, gardening and the ballet or opera and has a lifetime aim to climb (or at least see from afar) Everest. Dr Paterson worked in London, Brighton and Paris after qualifying in 1993. Her special interests include Ear, Nose and Throat and Women’s Medicine. As well as being a mother, Dr Paterson enjoys music and outdoor sports. 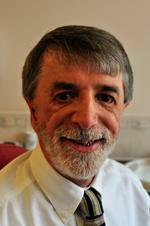 Dr Crocker initially qualified from Charing Cross hospital London in 1979 and undertook GP training in Reading. Having experienced several types of general practice he also explored hospice medicine before settling in this area some 15y ago. 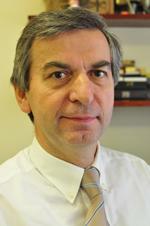 His medical interests include paediatrics,dermatology,palliative care and minor surgery as well as GP training. Outside activities include photography and travel - from Grizzly spotting in the Rockies to cycling the canal sides of Amsterdam! Dr Kate Parker was born, raised and trained as a GP in Belgium, before settling in W iltshire ten years ago with her British husband with whom she has a young daughter. In Belgium she ran her own single-handed practice for seven years, giving her a wide experience in all aspects of general practice. Dr Parker relaxes by spending time with family and friends, and enjoys reading, camping trips, walking and picnics. She loves almost everything about life in the UK,except a cup of tea. At present Dr Parker spends most of her time at St Damian's surgery in Melksham. Dr Smith qualified in 2007 from the Royal Free and University College Medical School in London. This was after a previous incarnation as a Postdoctoral research scientist at Imperial College London specialising in Arthritis and Cancer research. 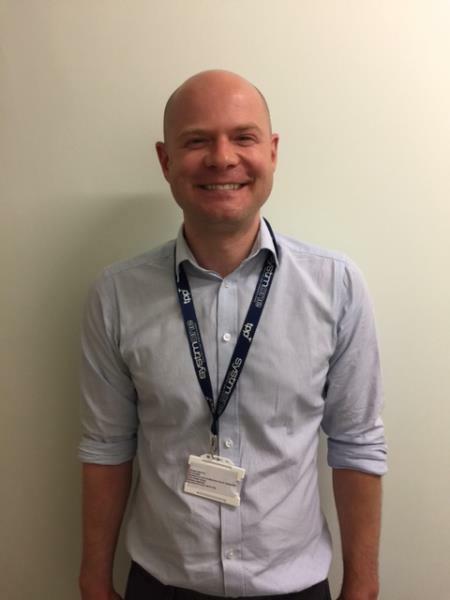 Since qualification, he has spent time working in Bath and Swindon before completing GP training in the Wiltshire area. In addition to having a young family in Bristol, Dr Smith enjoys Beekeeping in the Somerset area, and is a keen member of the Bath Beekeeping Association. Dr Davis qualified in London in 1998 from Imperial College and completed her General practice training in Bristol in 2003 where she continued to work up until joining The practice. 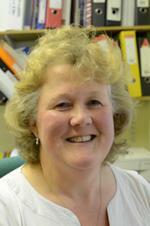 Her professional interests include women's health, sexual health and palliative care having worked in hospice medicine. Outside of work, Dr Davis is kept busy with two small children and enjoys time with family and friends, walking and trips away. She enjoys light opera and hopes when time allows to join an amateur society. A retired Partner from Bradford on Avon & Melksham Health Partnership, Dr Gough will continue to provide support to our Practice as an Associate. He will support us with training, injection and well woman clinic and will only run adhoc surgeries, he will no longer have a patient list. Dr Gough, qualified in 1977 and received further medical training at St Thomas’s, London, Oxford and Southampton, initially specialising in cardiology. 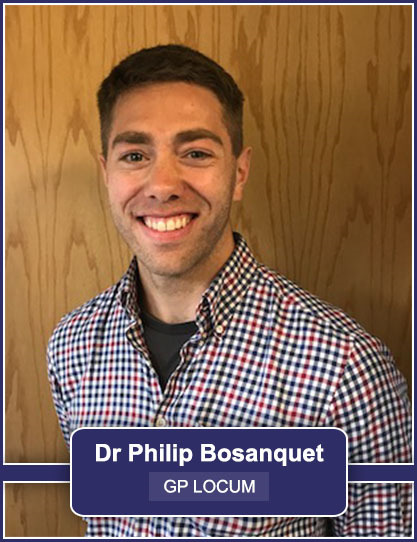 Missing the bits above and below the chest, he moved to general practice and also has interests in training GPs and occupational and sports medicine. Dr Gough is a keen classical musician, as well as enjoying a wide range of outdoor sports. Dr Salmon qualified from Nottingham University in 2005. She then completed hospital jobs at The Derbyshire Royal Infirmary and The Great Western Hospital, Swindon. Having grown up in Wiltshire she returned to complete her General Practice training in Wiltshire. 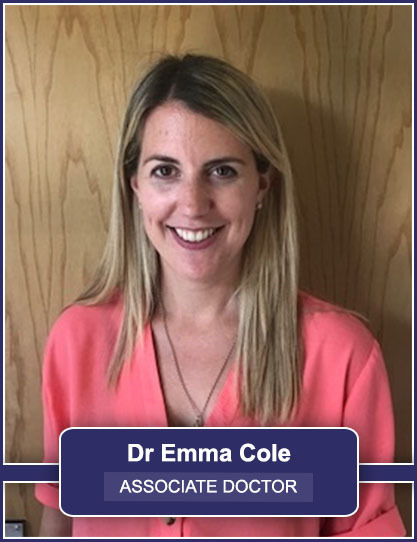 She has also enjoyed working in New Zealand and at the Olympics in London in 2012.Her special interests include Paediatrics, Women’s Health, Palliative Care and Occupational Medicine. D r Rodgers trained in Nottingham from 2006 and completed General Practice training in Somerset. Having grown up in Wiltshire, Dr Rodgers decided to return to the area after getting married in Bradford on Avon. He lives locally with his wife and their twin girls. In his spare time Dr Rodgers enjoys cycling, competitive Esports and copious amounts of tea. 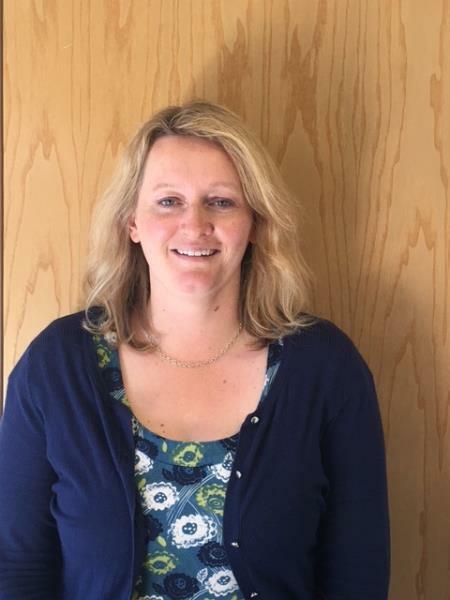 Dr Debbie Cash qualified as a doctor 1994 and completed her General Practice training in in 1999, during which time she spent time working as a doctor in a rural hospital in South Africa. Dr Cash has worked as a GP in Bath for many years and has special interests in dermatology and women’s health. As a practice we try to use locum doctors only when absolutely necessary – for example, to allow our GPs to be involved with major development work at the Primary Care Trust. We also try to use the same locums wherever possible to assist with continuity of care. They are a much needed and welcome part of our team. Dr Heffer qualified in Oxford in 1982 and trained for general practice in Winchester.His medical interests include diseases of the nervous system and the relationship between people’s work and health. Joined the Practice in April as a locum trained at St Thomas' Hospital London, he obtained a BSc in Anatomy in 1981 and qualified MBBS in 1984. Various posts in hospitals south of the M4 culminated in further qualifications of DCH, DRCOG and MRCGP, and eventually starting in practice in Westbury in 1991. Since that time, he has held posts in Cardiology at Royal United Hospital Bath, has obtained an MSc in Prescribing Sciences from Liverpool University in 2001 and is currently an Associate Member of the GMC, sitting on their Fitness to practice panels. As a GP training practice we are required to maintain high standards of care in order to train junior doctors (registrars). The registrars are qualified doctors who, having chosen general practice as their career, receive relevant postgraduate training in hospital specialities and then spend time at our practice in order to hone their skills further. Registrars are supervised by us throughout the 3 year training period and are attached to the practice for 4 to 18 months depending on the stage of their training. The aim of the training programme is to produce doctors who, on completion, will be able to provide personal and continuing GP care to individuals and families in the community. They will also have the management and administrative skills relative to primary care and have been able to audit and reflect on their work with a view to improving performance. Drs Gough, Crocker, Paterson and Patrick are the training GPs at the surgery. Since providing training throughout the practice we have maintained consistently high scores for the specialist examinations that the registrars take. Many of our registrars have continued to work as assistants across the practice. For training purposes it is sometimes necessary to video patients' consultations. This will only be done with your consent and personal physical examinations will not be recorded. The camera can be switched off on request and any recording deleted. We have a wide range of experience in GP training and trust we share our enthusiasm and inspire a similar high standard of care in the registrars. 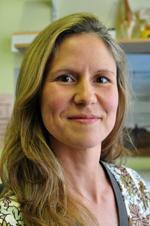 Dr Faulkner (F2) will be with us 4 months and will be mentored by Dr Louise Paterson. Neil Murphy & Donna Hodge are paramedic’s and will be working within the ‘Transforming Care for Older People Team’ based at St. Margaret’s Surgery. Heather Call, our new Practice Pharmacist joined the surgery in June 2016. Heather is here to assist the Practice Team in all areas relating to medicine. Heather is also available to speak with patients for any medication queries. 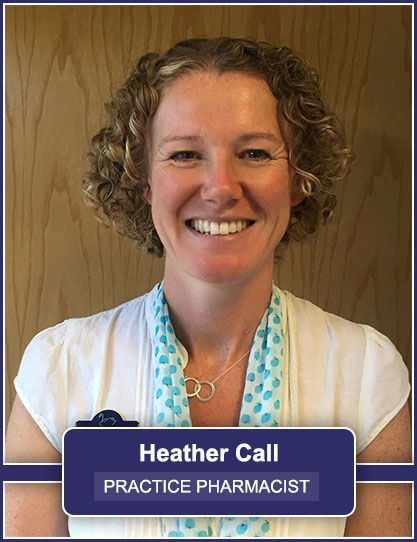 If you would like to speak to Heather, please book a telephone appointment. This appointment will be booked on a Monday, Wednesday or Friday morning. The practice employs a number of Emergency nurses and nurse Practitioners who are registered nurses with extra training in advanced Nursing practice. They are able to see emergencies, take your history, diagnose and treat a broad range of medical problems, working closely with the Emergency doctor for support and prescribe medication if necessary. Practice nurses are highly trained registered nurses involved in almost all aspects of patient care and treatment. They undertake more complex nursing tasks such as blood tests, urine tests, injections, major wound care, minor surgery and ear assessment. In addition, they run specialist clinics including diabetes, respiratory, coronary heart disease, adult/child vaccines, leg clubs/ulcers, women's health and promotion of health care. As a large, progressive practice we take part in national and international clinical trials, to further clinical knowledge and contribute to major scientific publications. All the trials done at the practice have national and local ethical approval and are selected so as to benefit our patients, as well as being important studies in their own right. All our GPs take an active role in recruiting patients for clinical research. We have a strong team of Health Care Assistants who give care under the guidance of the registered nurses. They have skills in blood taking; INR/Warfarin monitoring; ECG (Echocardiogram) and Blood Pressure monitoring; health checks/promotion; chronic disease management; urine tests and specimen collection; minor surgery support; ear syringing; simple wound care; smoking cessation; flu vaccine and B12 injections. Ellen is our Finance/Business Manager who started at BoAMHP in November 2016. 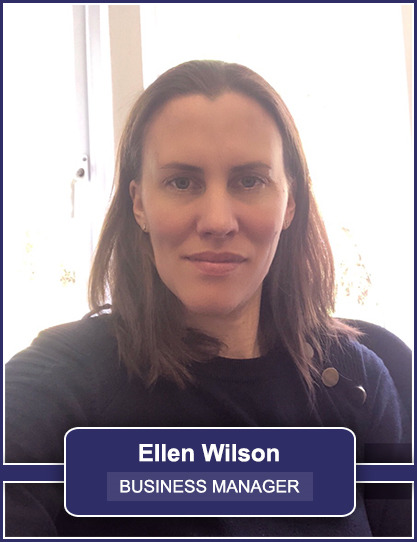 Ellen started her working life at Procter & Gamble, a multinational Fast Moving Consumer Goods company, where she gained 10 years Financial Management experience in a variety of different roles. Ellen has recently relocated to Wiltshire, from Aberdeenshire where she began her NHS journey, in a volunteer role for NHS Grampian. Ellen will play a vital role in our new management structure alongside, Michelle Coleman and Amanda Brookes. Ellen will focus on the Financial/Business side of the practice, providing a high level of accountability within the practice and a strategic focus on the future of the practice. Amanda Brookes joined the NHS in 1993 and has a wealth of knowledge about the National Health Service and the commissioning process. Until October 2016, Amanda held the post of Practice Business Manager for ten years, as a member of the senior management team. 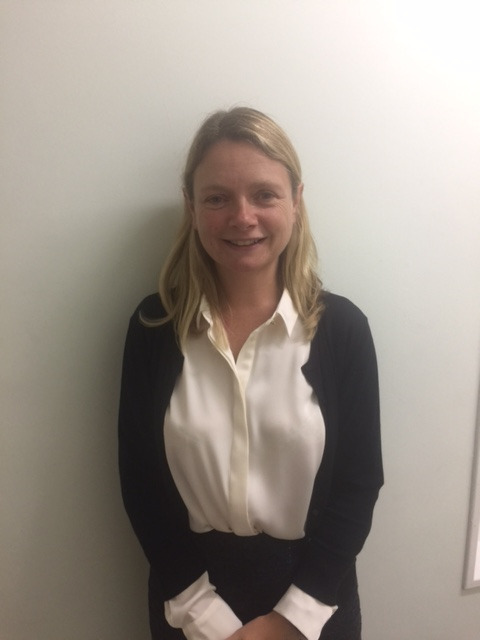 Amanda has now taken up the dual role of Project Manager for Bradford on Avon and Melksham Locality and is a member of the Wiltshire Clinical Commissioning Group GP Executive – West. 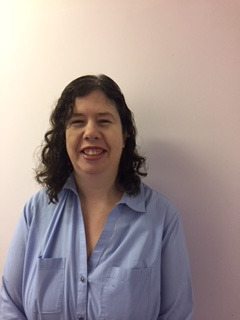 Amanda has received national recognition for a number of her current projects; including the setting up and running of Leg Clubs, Dementia Cafes, working with the Voluntary sector and developing an integrated team to provide care for Vulnerable and Older People across BoA and Melksham. Amanda is a member of the Institute of Health Care Management. 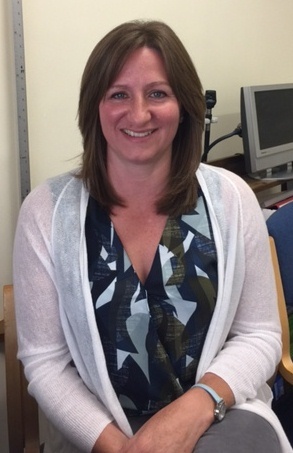 Amanda has wealth of Primary Care knowledge and is enjoying her temporary post as Interim Practice Manager. 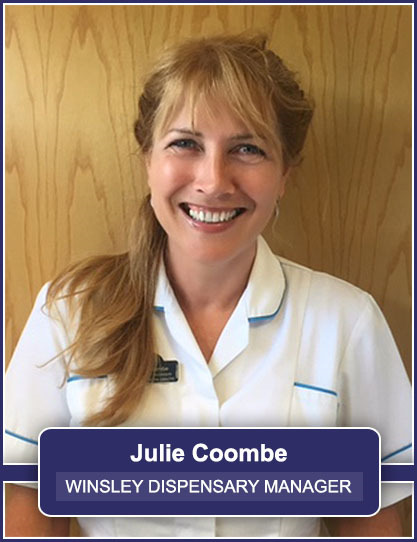 Julie Coombe is the Dispensary manager based at Winsley Health Centre and has been in post since the dispensary first opened. 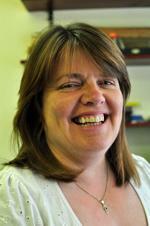 After qualifying as a Pharmacy Technician in Oxfordshire in 1982, she moved to Plymouth to work in the large hospital pharmacy where she gained experience working in all areas of pharmacy before becoming the Senior Technician in the dispensary for many years. After her move to this area in 2004, she spent two years working in a retail pharmacy in Bath before joining the practice in March 2007. 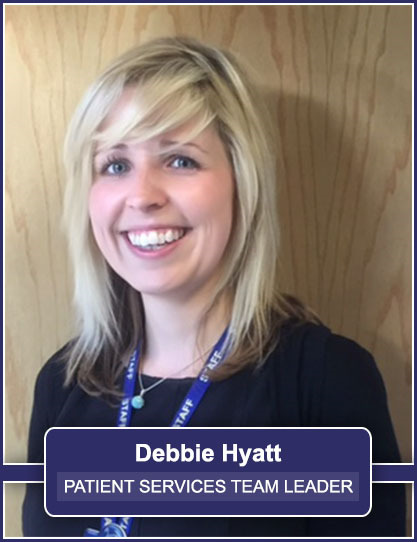 Debbie began her first role with the Practice as a Medical Receptionist in 2012 and quickly progressed on to the role as a Team Administrator in September 2012 before becoming Patient Services Team Leader in March 2015. Debbie works mainly at the Bradford on Avon Health Centre and is in charge of patient services across all Practice sites. Debbie manages the reception team and is also responsible for GP recruitment. Sarah has worked for the Practice as a Medical Receptionist for over 9 years, originally with the All Saints Medical Practice and welcomed the July 2011 merger between St Margaret’s Surgery and St Damian’s Surgery with the BOA Health Centre and Winsley Health Centre. Sarah was appointed to Team Administrator in 2013 and has progressed in her role to become St. Damian’s Team Leader in Melksham. Sarah is mainly based at the Melksham Practice, assisting with the development of the operational services provided by the Practice. This includes working with the Admin & Reception Team to enhance, refine and maintain a good level of service within the Results, Repeat Prescription, Patient Liaison and Appointment systems. Sarah works closely with Bridget Casey, Complaints Lead, and are jointly responsible for dealing with patient complaints and patient feedback. Sarah maintains and updates patient information on the Practice website, NHS Choices website and waiting rooms at all Surgery sites. Sarah is passionate about working with people and strives to maintain a high level of patient care service from the Admin & Reception Team. Welcome to our Practice. We are very proud of the services we provide and hope we are able to fully support the health needs of you and your family. We are continually looking to develop our services and welcome any comments you may wish to make. Our staff will be happy to provide you with any further information that you may require and will be happy to answer any questions that you may have. The Practice is supported by strong administrative teams who have a wealth of knowledge and experience. The receptionists, Administrators and Secretaries are highly trained in the skills required for their positions. Please remember that if they ask you questions, they are doing this under instruction from the doctors/dentists. These questions are aimed at making the practice run smoothly and they are not just being nosy. They have to judge the urgency of your request so please give them the necessary information. They are bound by the same rules of confidentiality as doctors and nurses. Previously known as District Nurses, the Community Nurses provide a specialised nursing service to patients needing care in their own homes. Community Nurses have specialist training in many areas including venepuncture, wound management, continence management, palliative care and intravenous infusions. All Health Visitors are qualified nurses, with special training and experience in child health, health promotion and education. They offer practical support and advice in many situations, including child development, nutrition and behaviour management in the under-fives. They can provide information about local parenting skills courses & make referrals to nursey nurses regarding child behaviour. Health Visitors visit new births at home between 10-14 days with follow-up support if needed. Follow up checks are also made at 6-8 weeks (babies will not be weighed at this check as this will be done by your GP at a 6-8 week review). The babies are also seen for their developmental checks at 9 - 11 months. Antenatal visits are offered for first time parents. A 12-16 week weaning group, 2 1/4 year health promotion group & child health clinics are also available. If you are new to the practice and you have children under five years of age, the Health Visitor will contact you after you have registered to arrange a visit. For more advice, information or services, Ask offer support to Parents and Carers. Ask is a 'not-for-profit' organisation and a registered charity that has established and built on its reputation for being a friendly and reliable service by providing a range of services that offer support to parents. For more information please visit their website. The Melksham Health Visitors are based at Melksham Hospital, there are 4 Health Visitors and 1 nursery nurse. The Health Visitor is always available for any concerns parents may wish to discuss. To contact your Health Visitor call 01225 701048. They also hold 'drop in' clinics at the local Childrens Centres. For more information about Canberra Childrens Centre please visit their website or alternatively please contact them on 01225 705225. For more information regarding Kings Park Childrens Centre (at the Primary School) please visit their website or alternatively please contact the Centre on 01225 707770. The practice has newly appointed Care Co-ordinator's to the team. The new role will support those patients who are often at risk of ill health and those with complex health needs to continue living well at home for longer. To find out more information about this new role for the practice, please click here to read the press release from Great Western Hospitals.